One for One. 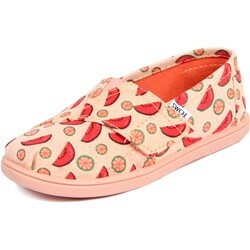 Buy any pair of Toms shoes and Toms will give a pair of shoes to a child in need. 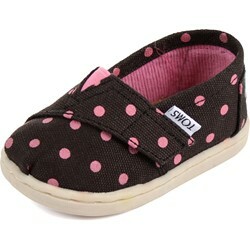 "Adorable, comfortable, versatile. Fit is slightly large but velcro makes up for the difference. Glad there's a bit more room for growth than usual. Happy purchase. Peachy pink in pic & in person. Did I mention, we love the watermelon?!"